Russian president blames outsiders for meddling in internal Ukrainian affairs in an attempt to overthrow legitimate authorities. Russian President Vladimir Putin said the anti-government protests in Ukraine were organized and planned by the West as an attempt to overthrow the country’s legitimate government ahead of the 2015 presidential elections. The protests, which participants are calling Euromaydan, are well-planned events, and the spontaneous protests, Putin said. In addition, the Ukrainian political opposition may be a cover for extremists, he said. “In my opinion, everything that is happening is not directly related to the interaction with the European Union. It is an internal political process, the opposition’s attempt to shake the acting legitimate authorities of the country,” Putin sad. Opinion: No good scenarios for Ukraine? The demonstrations against the decision of the Ukrainian Cabinet of Ministers to not sign an EU trade and political association agreement began on Nov. 21. So far, more than 300 people have been injured in clashes with police. “The events in Ukraine are more like a pogrom than a revolution,” said the Russian president. The Ukrainian opposition, however, claim the clashes with police were organized by government authorities, and the scenario of the events was developed by pro-Russian politicians. In response, Prime Minister Nikolay Azarov has apologized fro the clashes and said an investigation would hold those responsible accountable for the violence. Alexey Pushkov, the chairman of the State Duma Committee on Foreign Affairs said he is convinced Ukrainian authorities have become hostages to the actions of the radical opposition. “If it was directed by someone else and orchestrated, it was done by the supporters of the association with the European Union and by those European structures – political and social – that had worked on it,” Pushkov said. But many experts said they believed that the mass protests, regardless of the who organized them, are a social response to government policies. Meanwhile, the protests spread further into the country. On Monday, a general strike was declared by two cities – Lviv and Ivano-Frankivsk. 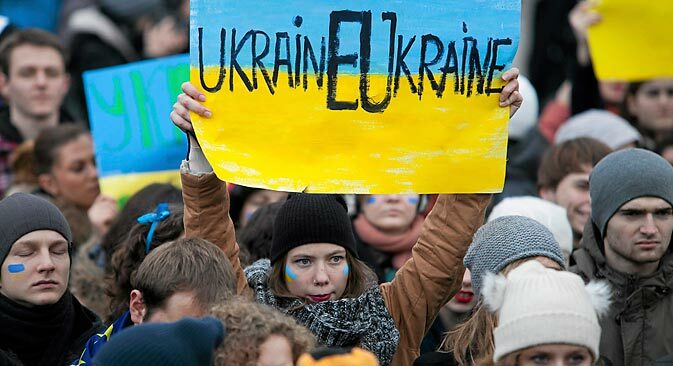 Residents of other regions joined Euromaydan in Kiev. Mikhail Tulskiy, the president of the Political Analytics Research Center said he believes that the events in Ukraine are a reaction of a society dissatisfied by the actions of the authorities, rather that a result of external influences. “The situation is that, first, more than one half of Ukraine’s population has quite a positive attitude towards the EU. Second, the next elections will be presidential and they are to be held in early 2015 – this is not soon, so we can hardly say that this was organized directly for any elections that may come,” Tulskiy said. According to Andrey Kortunov, the general director of the Russian Council on International Affairs, there are forces in Ukraine that will escalate the situation and accuse Russia of interfering, but on the other hand, it is possible that the authorities will ask Russia for economic assistance. “I do not exclude a situation that, if the crisis deepens, the Ukrainian leadership may appeal to Russia with requests for some concessions, such as gas prices or on other issues, so that Russia can help defuse the situation, or to reduce the intensity of the protest moods. That is also possible,” the expert believes. However, it is not likely that the mass protests can influence the decision of the Ukrainian authorities to suspend their rapprochement with Europe any time soon, Kortunov told RIA Novosti news agency. Even if they could, this will take time, and “there is a certain procedure, and, of course, even if the attitude changes, it will be necessary to re-engage the negotiation process, to set new time tables. This may require some additional clarifications and conditions,” he said. Based on materials from Kommersant, RIA Novosti and Vzglyad.